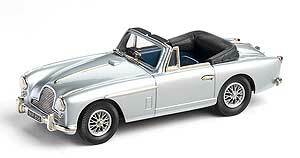 1956 Aston Martin DB 2-4 MKII Convertible from Lansdowne Models. 1:43rd Scale model hand built in England, in heavy white metal. When David Brown took over Aston Martin in the last 1940s, the DB2 was the first Aston Martin to use the excellent 2.5 litre Lagonda engine that had been designed by W.O. Bentley. 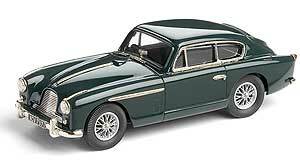 Intended as a rapid Touring car the DB2 became successful in competition also. By 1955 the DB2-4 Series 11 was equipped with a 2922cc version of the original Lagonda unit and was good for 120 mph with a 0-50 mph time of a whisker over 8 seconds.